The Tour Browser (available in Pano2VR pro), holds and organizes all the panoramas in a tour. Each panorama is represented by a thumbnail image. Set as Start Panorama – This will set the selected panorama as the starting panorama in the tour series. Remove Panorama from Tour – This will remove the image and it’s settings from the tour. Remove Selected Panoramas from Tour – If you have selected a few nodes, you can use this to remove them from the tour. Open in Finder/Show in Explorer – Click to highlight the image in Finder (Mac OS) or Explorer (Windows). Add Panorama – Add another panorama to the tour. This will open a dialog where you can pick the image file. Add Project – Select to add a Pano2VR project file (.p2vr) as an input source. This is especially handy if you started out with the standard version of Pano2VR and upgraded to Pro or if you just want to combine projects. Edit Master Node – Select to edit the master node. The Viewer will show an empty panorama indicating it is in master node mode. Name – The name of the tour image that has been added as the Title in User Data. Filename – The original file name and file path of the image. Node ID – This is the Internal Node ID number. 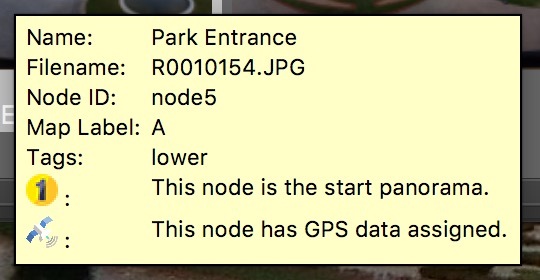 Map Label – This will show the node’s map label. Turn on labeling in the preferences/settings. Tags – This will show all the tags that have been assigned to the image. Start Panorama – The symbol with the number one indicates that the current panorama is the starting node of the tour. GPS – The blue satellite symbol indicates if there is GPS data assigned to the panorama or not. Filter to help organize your images. When you import an image, the folder name of that image will be added as a tag. This can be a fast way to automatically add tags to a lot of images. If you’re using a Mac, your Finder Tags will be imported as well. Tags can be added in the User Data or in the Tour Browser. You can also mix and match the filters. For example, you can filter by tags and distance. ✭ Tip: Clicking a filter will reverses the filter, showing all the nodes that do not pass the filter. For tags or text filters, the filter text is displayed as strike-through text. For a distance filter, the ‘<’ changes to ‘>’.